Often times, we refer to BJJ as community; by definition, a community is a group that shares a common characteristic and/or interest and perceives itself as distinct in some respect from the larger society within which it exists. Last year, the east coast BJJ community came together to support one of its own, by hosting seminars in order to raise awareness to help with Andre Margutti’s battle against lymphocytic cancer (read the story here) and to help raise money for The Leukemia & Lymphoma Society (http://www.lls.org). 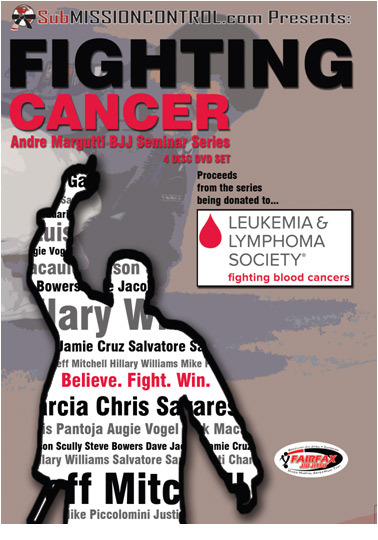 This four-disc DVD set (runtime approximately 370 minutes) entitled Fighting Cancer, showcases some footage from some of these great seminars. The various techniques shown in this DVD set ranges from beginner level cross chokes from the mount to some advanced reverse De La Riva sweeps. There is something for everyone!